In just 24 sessions of one hour or less, you’ll discover how to implement, monitor, and manage a TCP/IP network–even the latest cloud-based and IPv6 networks. Using this book’s straightforward, step-by-step approach, you’ll uncover the essentials of TCP⁄IP and put that knowledge to work through practical examples. Each lesson builds on what you’ve already learned, giving you a strong real-world foundation for success. Expert author and network engineer Joe Casad guides you from the basics to advanced techniques—including TCP/IP’s architecture, layers, subnetting, CIDR, routing, security, utilities, remote access, web services, streaming, and much more. 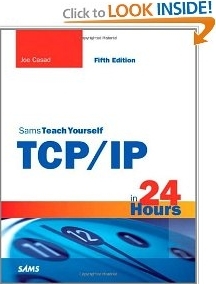 Practical discussions provide an inside look at TCP/IP components and protocols. Step-by-step instructions walk you through many common tasks. Q&As at the end of each hour help you test your knowledge. Notes and tips point out shortcuts and solutions and help you steer clear of potential problems. These issues are at the heart of TCP⁄IP. The following sections introduce these important features. You learn more about these features later in this book. A network adapter has a unique physical address. In the case of ethernet, the physical address (which is sometimes called a Media Access Control [MAC] address) is typically assigned to the adapter at the factory, although some contemporary devices now provide a means for changing the physical address. On a LAN, lowlying hardware-conscious protocols deliver data across the physical network using the adapter's physical address. There are many network types, and each has a different way of delivering data. On a basic ethernet network, for example, a computer sends messages directly onto the transmission medium. The network adapter of each computer listens to every transmission on the local network to determine whether a message is addressed to its own physical address.